"Leslie Caine deftly merges hate-fueled homicide with household hints." If it were within my power, the moment you opened one of my Domestic Bliss books, you'd be wrapped in a feather-soft cashmere afghan and swept into a cozy wingback chair in front of a crackling fireplace, with your beloved cat curled in your lap and your beloved dog at your feet (assuming, of course, that you're not allergic to either four-footed friend). All is never truly "blissful" for my designing duo, however. (If it were, I wouldn't have a mystery, nor a plot!) As the stories of my main characters unfold, they must deal with a mutual attraction that is counterbalanced with their profound inability to work together without quarreling. In Death by Inferior Design, they run up against a twisted killer who knows a painful truth about Erin Gilbert's childhood. In the second in the series, False Premises, Steve's former love pulls both him and Erin into a dangerous con game that proves deadly. Before things can settle down, in Manor of Death, Gilbert and Sullivan's dream jobs for the Historic Homes Tour turns out to be chockfull of deadly secrets and, perhaps, with a not-so-friendly ghost stirring the brew. Killed by Clutter has Erin and Steve pitted against an incorrigible packrat...and a ruthless villain, willing to stop at nothing in a race to find a secret hidden within the packrat's home. 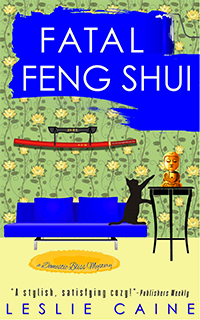 In Fatal Feng Shui, although Erin and Steve have become partners, Erin finds herself left on her own with her best-made plans, her worst fears, and someone whose design is to kill her. In Poisoned by Gilt, Erin and Steve enter a competition to design and build the most earth-friendly home in Crestview, Colorado... but who would have dreamed that someone's idea of saving the planet might include murder? In Holly and Homicide, interior designer Erin Gilbert has it all: the man of her dreams and a dream job—remodeling a B&B in a Colorado ski resort by Christmas Eve. Then Erin's long-lost former boyfriend suddenly appears and promptly plants himself in the middle of the cozy twosome, the lodge's festive lights are strung around someone's neck...and Erin's holiday season becomes a holy terror. With her nuptials less than 3 weeks away, Erin Gilbert is designing a wine cellar for Aunt Bea—Steve Sullivan's honorary "Aunt" (who Steve privately calls "the loon from the family closet"). But Erin, not as much of a skeptic as Steve, fears that Aunt Bea's prediction that they "unleashed an evil spirit" during construction in her cellar could come true!! When the new chef, the colorful Lucas LeBlanc, crashes the couple's wedding shower and brings his own hors d'oeuvres to serve, Erin's wedding planner collapses—his face bright red—and dies. The police discover a sapphire necklace in his pocket—a family a gift from Aunt Bea that has caused family disquiet before...and suddenly, everyone's a suspect!! If she doesn't find the real killer soon, Erin fears that the wedding she so carefully planned, will end in ruin! 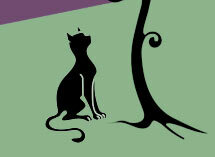 "Sparkles with charm, design lore, and a sleuth with a great mantra. Cozy fans will embrace the Domestic Bliss series." It's Christmastime in sleepy Snowcap, Colorado, and the town is up in arms. The venerable Goodwin Estate has been sold to enterprising out of towners and is getting a major makeover just in time for the holidays. Interior designers Erin Gilbert and Steve Sullivan walked smack into a storm of chaos: the estate's new owners, including one whose idea of holiday decor involves inflatable elves and a gingerbread facade, are battling among themselves. Erin's big-talking ex-boyfriend shows up just in time to make Sullivan crazy jealous, and when a local building inspector is found strangled with a strand of Christmas lights, Gilbert and Sullivan begin to suspect it might be time to leave this psychodrama of a project behind. FEATURING DOMESTIC BLISS HOME DECORATING TIPS! "With her quirky cast of characters and seasonal decorating tips, this delightful holiday caper makes the perfect gift for under the Christmas tree." "The whodunit is fabulous because it is cleverly constructed with red herrings and twists to keep the reader, police and Erin guessing who the killer is. The romantic subplot blends well with the detecting... Leslie Caine has written a charming colorful cozy starring a captivating amateur sleuth and the men in her life." To the newly formed design team of Steve Sullivan and Erin Gilbert, it seemed like a great idea: a competition to design and build the most earth-friendly home in Crestview, Colorado. But who would have dreamed that someone's idea of saving the planet might include murder? "Fans of charming interior cozies and trips to Home Depot will appreciate this tragic twist on the challenges of eco-friendly innovations." "Poisoned By Gilt is the sixth book in Leslie Caine's highly popular A Domestic Bliss Mystery series. 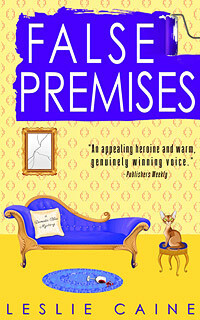 With each installment, Caine devises the most charmingly written mystery filled with choice interior design morsels that make reading her books an absolute delight." 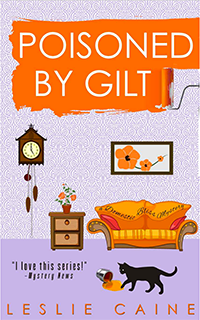 "Readers will thoroughly enjoy this entertaining amateur sleuth tale...Poisoned By Gilt is filled with charming characters, a courageous heroine and a pitiful villain, who come together to make an engaging whodunit." Interior designers Erin Gilbert and Steve Sullivan have become partners, only to find that their very first clients have so distorted the principles of feng shui—the ancient Chinese art of harmonious design—that they've declared a Feng Shui War with their neighbors. An attic erupts in flames. The death of a carpenter strikes Erin too close to home, while a dangerous beauty wants to get much too close to Sullivan. Erin finds herself left on her own with her best-made plans, her worst fears, and someone whose design is to kill her. "An appealing heroine and warm, genuinely winning voice." "Interior design is a hot topic, and Caine delights readers with her enigmatic protagonist, who not only solves crimes but offers a few design tips along the way. 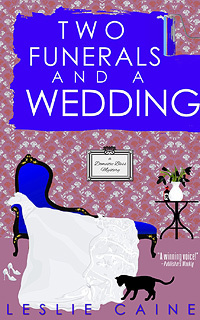 Humor is never in short supply in this fun, engaging mystery, which is certain to delight fans of cozies." "False Premises is a great mystery that puts you on the edge of your chair until the end.... What's appealing about the characters is that they focus on solving the mystery, while the relationship tangles accessorize the story nicely." At first glance, decorator Erin Gilbert fell in love with the charming little bungalow on a quiet street in Crestview, Colorado. Until she stepped inside. There, eccentric widow Helen Walker has created a maze of bric-a-brac, papers, and just plain junk that she won't throw out. Even worse: two bizarre deaths have convinced Helen she is being stalked by a serial killer—and that any one of her nosy friends and neighbors might be to blame. Somewhere in the clutter is at least one thing to die for. 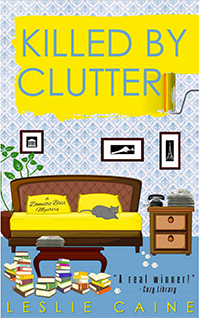 "Although I hadn't read the three earlier books in the Domestic Bliss mystery series, I jumped right in and started enjoying Killed By Clutter on page one. I'm a fan of reality television shows like Clean Sweep, which take on de-cluttering and reorganizing homes that are totally out of control. (Those shows have a way of making me feel my own clutter problem is mild and manageable.) Combine that element with a straightforward plot, smooth writing and likeable characters—and Killed by Clutter is a real winner." "I really enjoyed Killed By Clutter. I liked Erin's sense of style and way about her. She isn't without flaws and so I found a fun connection to her. Filled with plenty of ideas about decorating, and with a good solid mystery to solve, this is a fine cozy to add to your reading list." Erin Gilbert is paid to bring spaces to new life-not to uncover murder. But from the beginning of her job in a Victorian manor, things are totally out of control. It starts with the sighting of a ghost and leads to the discovery of a decades-old secret, a hidden dead space in the attic, and the shocking death of a beautiful young woman. "Caine delivers another top-notch Domestic Bliss whodunit, her third after False Premises and Death by Inferior Design.... Nifty decorating tips complete the package." "The zany personalities and the interaction between them is the novel's most appealing aspect... 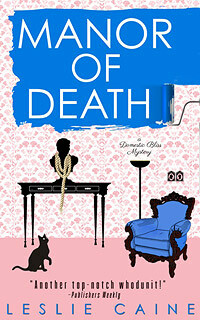 Throughout Manor of Death, the author seldom wavers from a gripping, pulsing narrative voice that appropriately fits the role of a 20-something, single interior designer." "...Leslie Caine once again concocts an interior decorating themed mystery that is sure to please her fans. With numerous design tips brilliantly painted throughout the canvas, Caine's storyline is smooth as silk as she expertly designs the perfect murder. The sexual tension between Erin and Sullivan keeps the reader turning the pages and the exquisite backdrop descriptions keep the interior decorator in us all wanting for more. Manor of Death is a designer's dream!" Interior designer Erin Gilbert was dazzled by her beautiful, free-spending client and new friend, Laura Smith. Dazzled, that is, until she visits Laura's magnificent house and finds that the priceless antiques she painstakingly acquired at Laura's behest have been completely replaced with fakes! When Laura's explanations ring as false as the erstwhile Louis XVI foyer mirror, Erin begins investigating her friend's colorful life and times—and then gets interrupted by a murder. As fate would have it, Erin has uncovered the same world-class scam artist who all but destroyed her handsome-but-embittered archrival, Steve Sullivan. While Sullivan aches for revenge, Erin wants answers—even while she juggles a sputtering romance, a burgeoning business, and one very boorish client. For Erin, it's bad enough that bodies are being strewn in all the wrong places. It's even worse that one suspect perfectly fits each crime: Sullivan himself! Neither designer could suspect that rearranging two spaces on a winter weekend would set off an uproar in the neighborhood—of quirky homeowners, passionate secrets, and marriages in need of extreme makeovers. Looking for a friend in this perilously unhinged environment, Erin wants to think that Steve might turn from competitor to ally... But somewhere between her faux wall finish and her custom window treatments, Erin is in for a shock: it seems that a killer has created this designing job just for her! 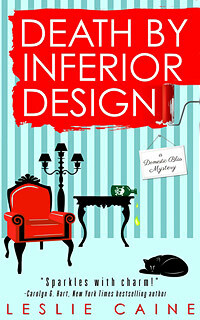 "TREND: For killer decorating tips, pick up Death by Inferior Design, a murder mystery by decorator Leslie Caine. Advice is woven into this whodunit featuring rival designers as sleuths." "This story is delightful in every way, and author Leslie Caine packs a solid punch.... Death by Inferior Design is entertaining, humorous, serious, and totally engrossing from first page to last. This tidy murder mystery has everything, from witty repartee to sorrow, from strong characters to a thrilling plot. And sprinkled throughout are tasty decorating tips you'll never find in House Beautiful or HGTV. As a writer, Leslie Caine has what it takes. 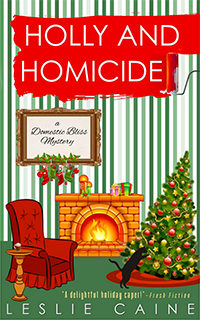 I can't wait to read her next Domestic Bliss Mystery." "This was a wonderful, well-written, book. There was mystery, suspense, some romance. All in all this book had all the elements of an outstanding mystery book. The reader will find themselves getting caught up in the story, you start forgettng you are reading a fiction book. This reviewer wanted to jump in the book and protect Erin from all the dangers which were around her. If you are a die-hard mystery buff, you will want to make sure this book is in your To Be Read pile, right at the top. I highly recommend this book."